You all love xiaolongbao right? 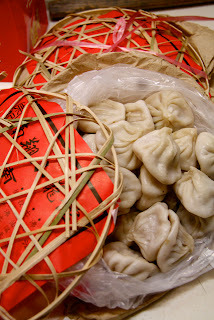 But those small and miraculous soup-filled dumplings Shanghai is famous for probably didn't ever originate in Shanghai. They came from a place called Nanxiang, considered by many to be the ancestral home, even the spiritual home of xiaolongbao. Once, long ago, Nanxiang was a happily separate little town south-west of Shanghai, but as the city sent out tentacles of roads, factories and apartment blocks in every direction it choked and then digested many smaller towns in its wake. Nanxiang was completely subsumed into the super-uber-mega-lopolis that is modern-day Shanghai, and is now relegated to the status of outer suburb. It even has its own stop on the Shanghai subway system. But Nanxiang doesn't feel like the outer something of somewhere, in fact it feels like the centre of somewhere. This is because Nanxiang holds tight to one important quality that sets it apart from all the other grey and gritty outer suburbs. It is still a major mecca for xiaolongbao lovers, who make the pilgrimage from all over China to get to the source. 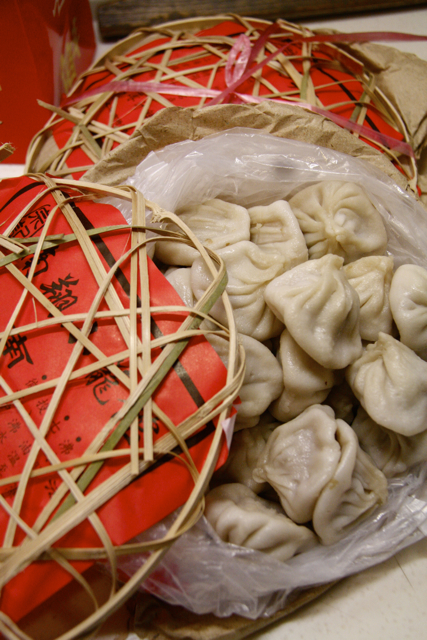 Whole streets are lined with dumpling shops rolling, stuffing and twisting xialongbao into shape. If you're reading this and wondering what on earth I'm talking about, xiaolongbao are a type of Chinese dumpling filled with a savoury mixture of pork and gelatinised stock, which melts on cooking to form the famous soup inside. Whole websites and forums are given over to arguing the finer points of particular xiaolongbao from different restaurants all over the world who all claim to have the best xiaolongbao. But you can't fully understand a food, I think, until you've eaten it in its original form at its source. It certainly adds to the appreciation, doesn't it, of eating more 'evolved' versions and makes for an interesting comparison. 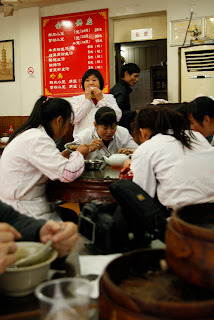 So today I took a trip to Nanxiang to experience the home of xiaolongbao for myself. With dozens of xiaolongbao restaurants to choose from it was never going to be an easy choice, so I suggested an old-fashioned pub crawl, only involving dumpling houses, to last all afternoon until we were filled to busting. My friends, sadly, thought we might save The Great Dumpling Crawl for another day because they also wanted to see temples and gardens and the old town. Oh well. 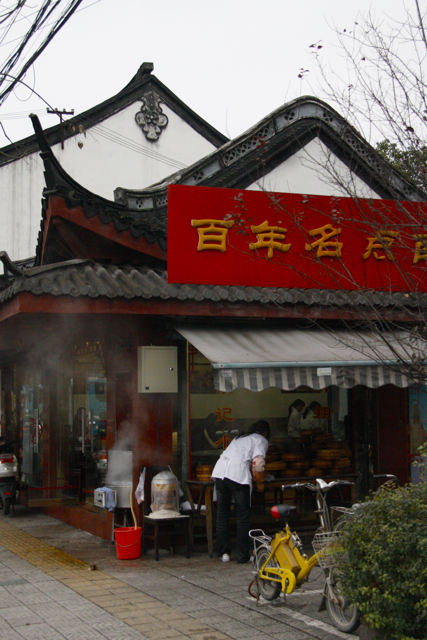 The original plan had been to try the Gulong Restaurant inside Nanxiang's Guyi Gardens, but incredibly, Nanxiang's most famous xialongbao shop was closed, shut up and gone. Possible relocated, but who knows. 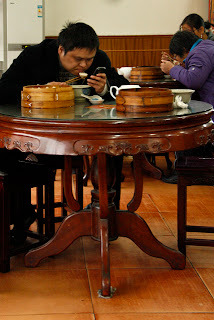 I had already tried the hideous thick-skinned, doughy, greasy atrocities of the Nanxiang Mantou Dian (Nanxiang Steamed Bun Shop, originally from Nanxiang but now inside the Yu Gardens in Shanghai, where a long queue of tourists, both Chinese and foreign, wait to be fed absolute rubbish) and I wasn't going to repeat the experience. 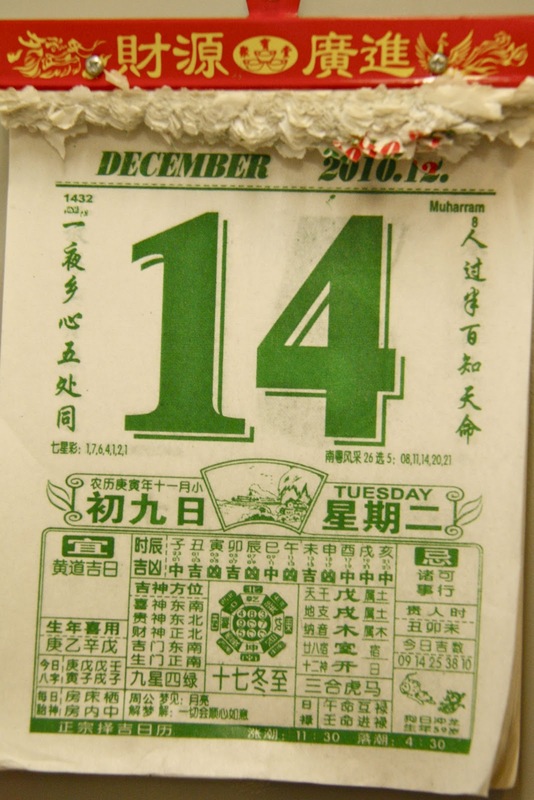 So the two most famous xiaolongbao restaurants were crossed off the list. Luckily, we had some local know-how in the form of Kevin (not his real name, but he chose it) who had driven us to Nanxiang. In his view, there was only one place to try and it was Song Ji at 210 Guyiyuan Lu. 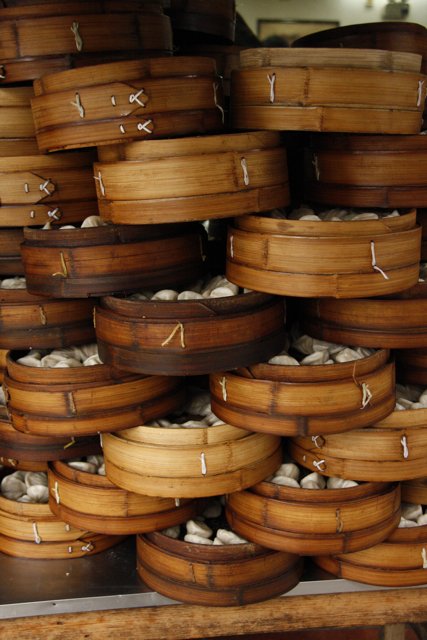 Outside, stacks of steamer baskets full of plump xialongbao were waiting to be cooked in the giant outdoor steamer. Inside, round wooden tables were filled with people dipping their xiaolongbao in dark vinegar then slurping up the filling. The menu ran to two choices of xiaolongbao - pork, or pork and crab, and five extras, all soups. 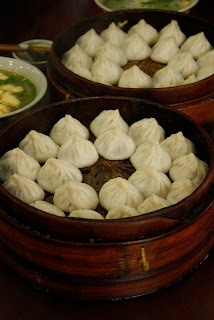 The pork xiaolongbao cost 20 yuan for a steamer basket of twenty, and the pork and crab 30 yuan for twenty. That's about 16 cents each. And the taste? 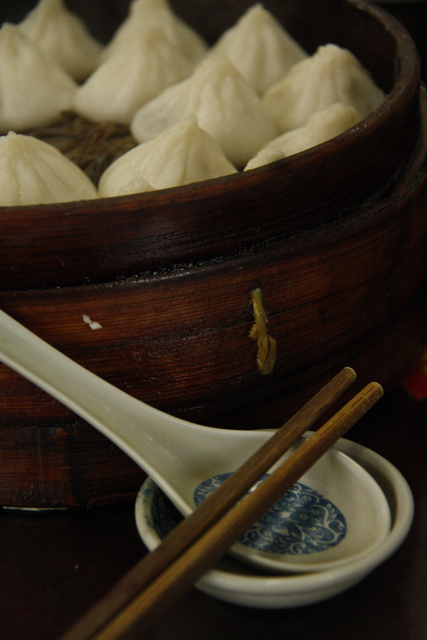 These xiaolongbao are justifiably famous, but they have a simple, homemade quality. 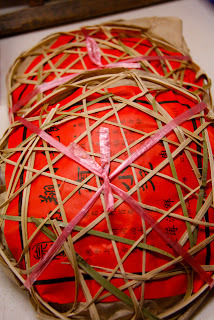 The skins are thicker than those at say, Din Tai Fung, because they're hand pressed rather than rolled, and the filling is simpler and More rustic with less seasoning and more meat. The soup, particularly of the pork and crab xiaolongbao, was delicious and dangerously hot. We tried two of the five soups on offer, a tofu and vermicelli soup, and a beef stock soup. The first wasn't really memorable, and the second we will never forget because in the bottom of the bowl were cubes of cooked congealed blood. I think we'll stick with the xiaolongbao! Take-away packs were available too, cooked then packed inside two bamboo shells to protect them, like a giant clam. 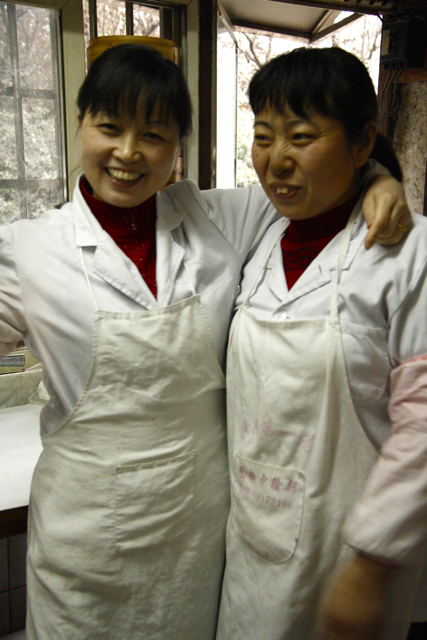 They re-heated pretty well in the steamer at home, but had less soup inside than the restaurant xiaolongbao. If all this has left you desperate to try your own xiaolongbao at home, you can read up on my recipe for the soup jelly, and the xiaolongbao recipe. Tomorrow: more on Nanxiang - and a xiaolongbao video!